Mention summer gardens and the first thing to come up is which tomatoes are you growing? 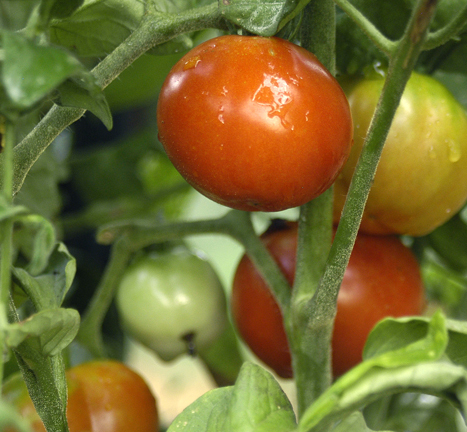 Year after year tomatoes are one of the most popular vegetables grown by our customers. In our 2017 catalog we offer more than 100 different tomato varieties. There are currant tomatoes as small as a dime and big beefsteaks like Mortgage Lifter and Brandywine that can weigh well over a pound (plus every size in between and more shapes than most gardeners can imagine). In addition to the ever popular red and pink varieties there are orange, yellow, black, bi-color and even green varieties. We offer something for every gardener, but how to decide which to grow this year? 1. Flavor and texture – the first thing I consider is fruit qualities like flavor and texture for the sandwiches, sauces, and salads we like to eat. 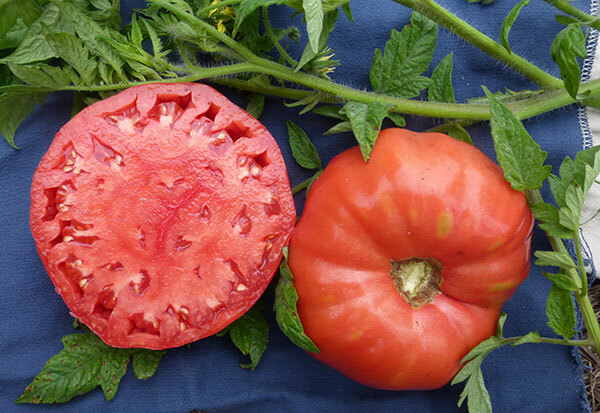 Radiator Charlie’s Mortgage Lifter tomato (photo top) is a large heirloom slicer with superb flavor, but be prepared for its long season and indeterminate growth habit (read on). 2. Days to maturity – is not just important for those with a short growing season. In many areas of the Southeast there are two seasons for tomatoes and other summer vegetables. The period in late July and August when it is too hot for tomatoes and sweet peppers to set fruit well, means we grow two crops: one to mature before the hottest spell, and one after. Fast-maturing early and medium days to maturity varieties are really important in such areas. 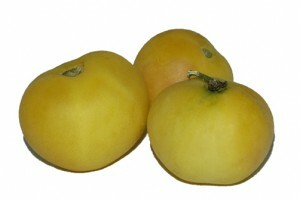 Stupice is a favorite early variety: the small-to-medium size fruits have excellent heirloom-type flavor. We also list several Extra-Early tomatoes. 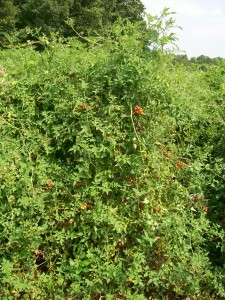 -Indeterminate tomatoes keep growing, flowering and setting fruit until stopped by frost, disease, or really bad weather. Most Cherry and large beefsteak tomatoes are indeterminate, They need to be caged or staked with a really sturdy support. Most really large heirloom tomatoes are indeterminate. These varieties are great if you have plenty of space, warm summer temperatures, and a long enough growing season. 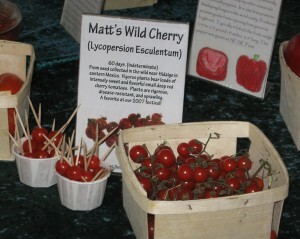 Delicious and super productive Matt’s Wild Cherry (photo) is a very small cherry tomato with tall, determinate plants. -The Dwarf Tomato Project has given gardeners a new set of options, with short (2-4 feet tall) plants bred from heirlooms, and retaining heirloom flavor quality, that are easier to trellis and to grow in containers. We offer Rosella Purple, for diminutive plants with fantastic fruits similar to Cherokee Purple. 4. Disease resistance-Find out which diseases are common in your area and select resistant varieties whenever possible. 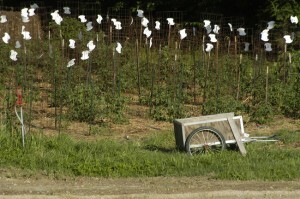 As organic gardeners our first line of defense is prevention. When reading a seed catalog or looking at the back of a seed packet, disease resistances are often shown with an abbreviation after the name. For example verticilium (V) and frusarium (F) wilts are common soil-borne tomato diseases. Look for the V or F after the variety name. Nematodes (N) are another common disease with resistant varieties available. Roma VF and Tropic VFN are excellent disease resistant varieties and show how the disease resistance is sometimes incorporated in the name. Choosing tomatoes to plant in your garden can be a bit tricky if you don’t know a few key terms. Since there are so many different tomato varieties out there, it can be hard to figure out which one is right for your garden. Some varieties are perfect for making sauce, while others are great for tossing into salads all summer long. All of the tomato seeds Southern Exposure offers are non-GMO and non-hybrid. 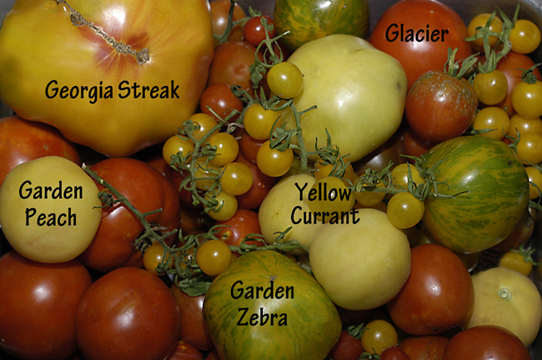 Most varieties are heirloom tomato seeds. People often debate about what “heirloom” means, but to us, an heirloom variety is generally one that was introduced before the widespread use of hybrid varieties in industrial agriculture. This began around 1940. 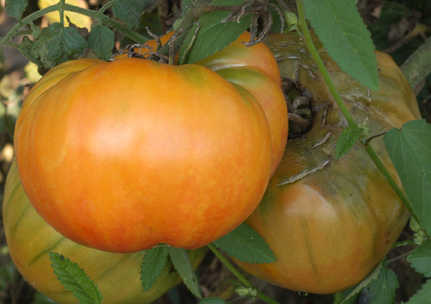 The integrity of our heirloom tomato seeds has been preserved thanks to open pollination. Most of our tomato seeds are also certified organic, which means the seed was collected from plants grown without exposure to petrol chemicals. The distinction between determinate and indeterminate tomatoes sometimes leaves people baffled, so here’s a little tutorial. Determinate tomatoes will stop growing at a certain point, and generally they are shorter in height than indeterminate varieties. Here in Virginia, if a determinate tomato plant grows to be five feet tall, the same plant could be three feet tall in a colder climate. Either way, there is a limit to how tall a determinate tomato plant will get. 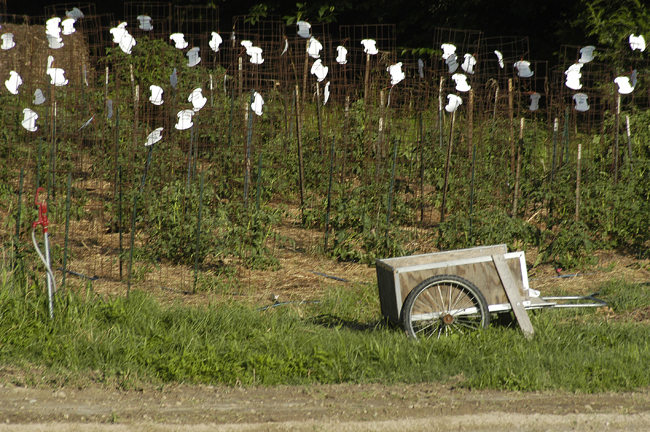 An advantage of growing determinate tomatoes is that there is less trellising work involved. Also, if you are going to be canning fresh tomatoes, you will probably want to go with a determinate variety as most of the fruit will need to be harvested over a short period of time. The disadvantage of determinate tomatoes is that they have fewer leaves than indeterminate varieties, meaning that the plant is less likely to receive nutrients. More leaves = more nutrients = tastier fruit. So, if you are hoping for a tomato plant that will consistently bear smaller amounts of tomatoes for snacking, sandwiches and salads, you’ll want to go with an indeterminate variety. gets wet, however, the ripe tomatoes sitting on the ground will certainly rot, so I’d recommend only trying cage-free tomatoes in hot, dry weather. Exposure, we use five-foot-tall cages made with concrete-reinforced wire cut into pieces that measure two to three feet in diameter. Also, we make sure to secure our cages with sturdy posts so that they don’t fall over. 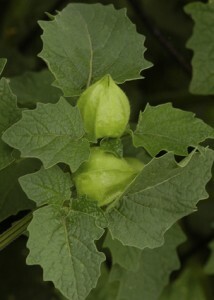 Thanks to some of our seed growers just up the road, we now carry fives types of tomatillos! Our most recent addition is called Purple Tomatillo. In honor of this, I’d like to briefly explore the world of husk tomatoes with you. Husk tomatoes, as our catalog describes, “are distinguished from tomatoes by the light-brown, papery husk which enlarges and covers the maturing berries.” Picture Chinese lanterns with goodies inside of them, and you’ve got husk tomatoes! 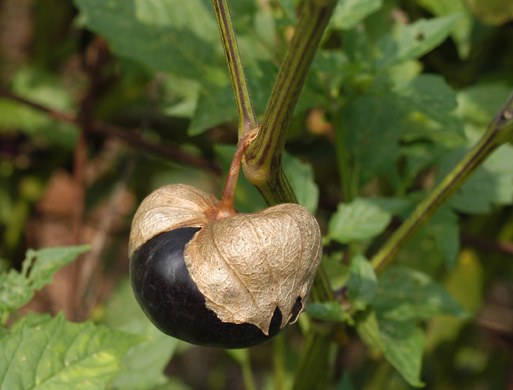 Ground cherries and tomatillos are the two most commonly cultivated species of husk tomatoes. Tomatillos are commonly used for salsa and other Mexican foods, and they are often cooked to bring out their full flavor. Ground cherries, on the other hand, can be eaten raw. They are deliciously sweet, so you could also try them in sauces, preserves, pies and other desserts! *Personally, I’d say that Garden Peach is the most scrumptious tomato I’ve ever tasted. These little pinkish-yellow bulbs make the perfect snack, and if you pick them when light green, they’ll store well without splitting. Matt's Wild Cherry Tomatoes were a favorite at Mother Earth News Fair and the Heritage Harvest Festival!